However, this new Barbeque Nation is a touch bit different from the others. While it retains its major hits in the food and service, the new outlet sports their new upbeat orange and white logo. The restaurant boasts of changes to the colour schemes and decor in addition to some fascinating accompaniments to its original fare, both to its grills and buffet menu. Inaugurated on the same day by Kannada film actress Kavya Shetty, I got a great chance to try their new menu firsthand. Being the non-vegetarian that I am, I headed straight to the exotic meats section which had rabbit, quail and duck along with shredded chicken, fish and sausages. Like most of the barbeque places nowadays, the food was prepared right in front of me. I had chosen a combination of rabbit, chicken sausages and quail which was made spicy and tangy right according to my taste. 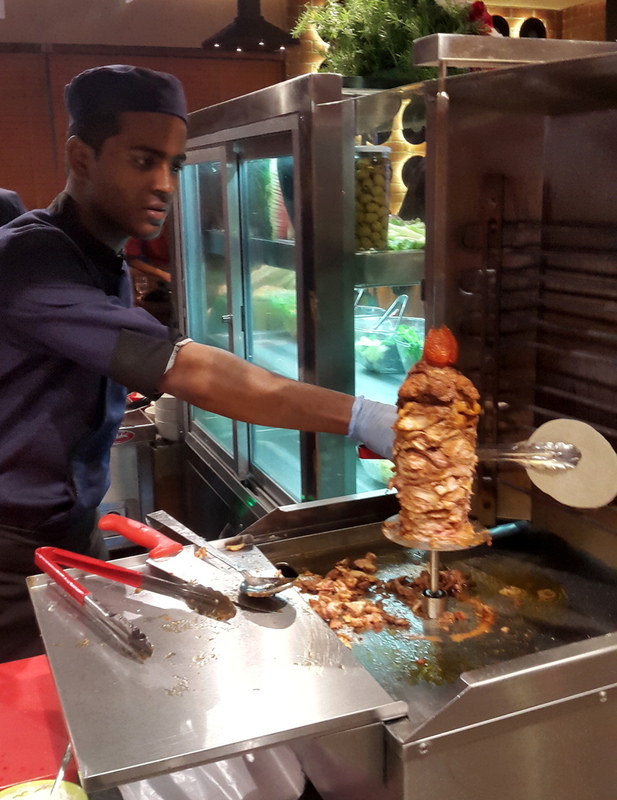 Right next to the exotic meats was the shawarma counter where layered chicken was put together and roasted on a vertical spit. 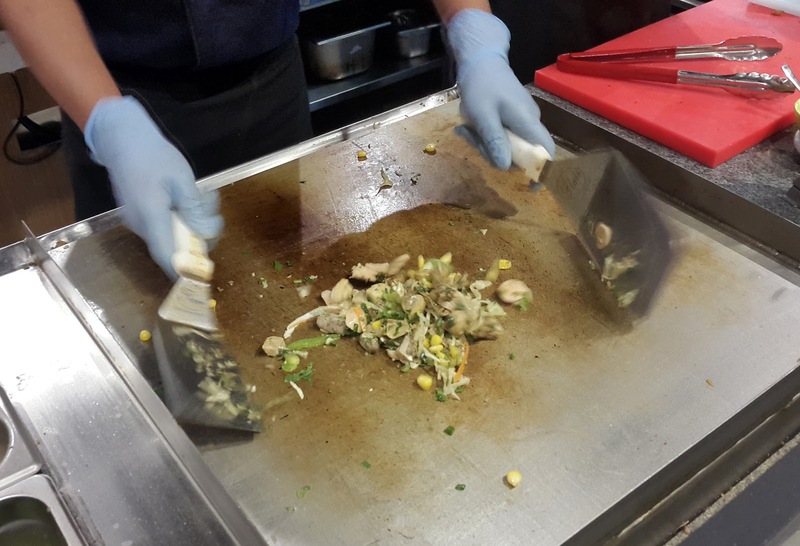 Shavings are cut from the block of the meat and served with chopped veggies, mayonnaise in a pita roll. 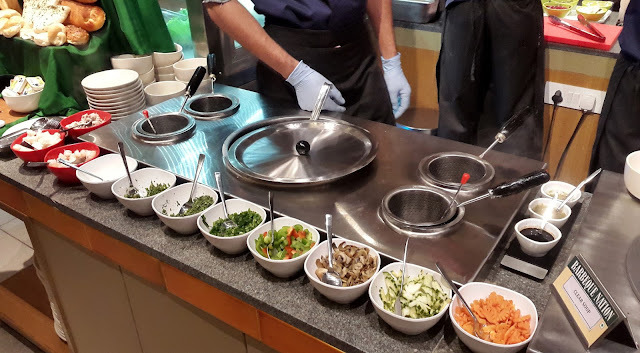 Close to our seat was the Kathi Roll Counter, where roomali roti wrapped rolls were being made available to the customers. 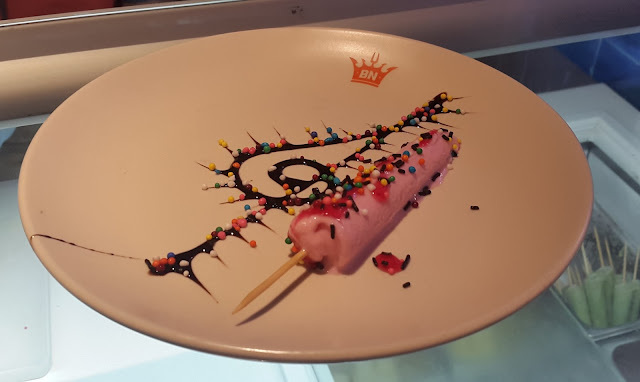 There was an option of four different fillings like mushroom, paneer and chicken, of which I chose to have the chicken tikka one. I didn't quite like the kathi rolls as I felt they were a bit oilier than necessary but there were folks who guzzled down the kathi rolls in a jiffy. 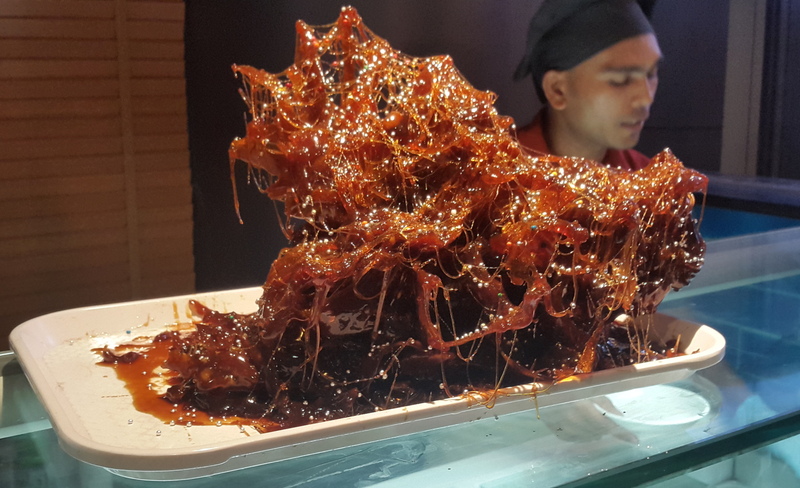 While the chain is most famous for its grills, the blend of American, Mediterranean, Oriental and Indian cuisine in the buffet is always overshadowed. The buffet section in the Doddanekundi outlet is reinforced with some major changes including a soup station, dal station and a biryani section. I visited the soup station first. A vegetable clear soup stock is prepared and is kept as the base for all soups which can be customised with a choice of shrimp/prawn, chicken and exotic vegetables. Additionally one can also add vinegared chillis, soya sauce and salt and pepper to enhance a particular taste even further. Another new addition to the buffet menu is the Dal Counter. 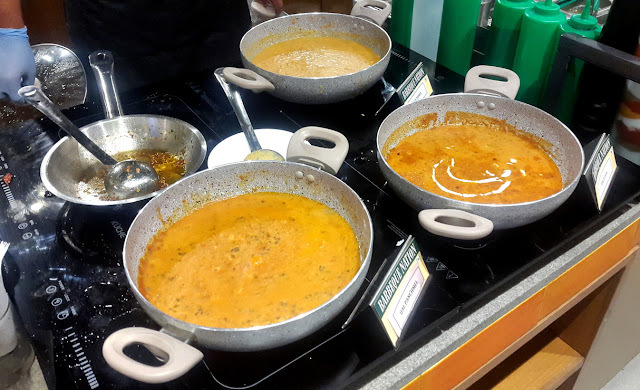 The Dal Counter had three different types of Dal - Dal Panchmel, Dal Tadka and Dal-e-Dum. The chef present at the station is armed with various whole spices and dry chilli which is first roasted in oil/ghee to make the tadka for the daal. I liked the Dal Panchmel the best which was a mixture of five different types of daal - arhar, moong, chana, urad and toor. The dal was sweet but had a zing of the achari oil which was poured along with the tadka. Other than these they have their general set menu which is available in the buffets. The biryani counter which previously had a vegetarian and a non-vegetarian biryani now gets a third type too with folks getting an option to choose from the Hyderabadi and Awadhi preparation of the biryani. On the day I went, Lucknawi Mutton Biryani was up for grabs along with Hyderabadi Chicken Biryani. Each Biryani comes with its own characteristic salan and raita too. The last but not the least, we visited the dessert counter which was filled with an assortment of goodies like pastries, cupcakes and fruits. Indian desserts such as moong daal halwa and jalebi with rabri was definitely a big hit in the group with kulfis often making their melt in the mouth appearances. The new menu seems to lay more focus on the customizations which can be made available to the diner. I personally think this is a great move as the greater variety in spices and marination will result in people not having to adjust to the daily sale but modify preparations to suit their individual tastes. 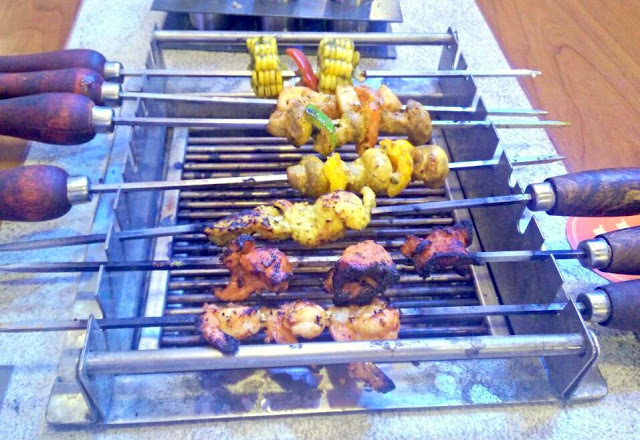 The buffet costs comes to around Rs 900/- per person.